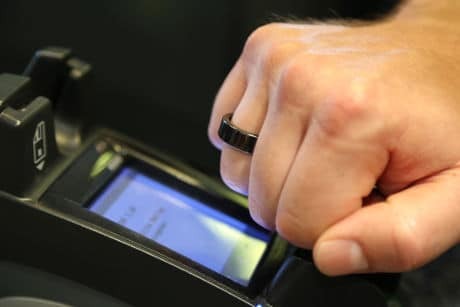 NFC Ring has made its payments ring available to order worldwide, enabling wearers to make purchases with the tap of a finger at any contactless terminal. The device is linked to the user’s debit card to fund transactions and includes a contactless security chip from Infineon. “The tiny, waterproof smart wearable works like a contactless payment card,” NFC Ring says. “Users can pay by simply holding their finger with the ring close to any EMVCo contactless-enabled payment terminal. Since raising funds on Kickstarter for its payments ring in July 2013, the company has made “several new versions” of the ring, including its latest — payment enabled — device, the company’s chief operating officer Shelly Silverstein told NFC World. Visa supplied athletes at this year’s Rio Olympic Games with an NFC Ring linked to their Visa account, allowing them to make purchases by tapping their hand against contactless terminals. The devices retail at £39.99 (US$52.78) and are currently available to order from the company’s website.